Next, take the polish color you want underneath the glitter and use it to paint in the V created by the tape. 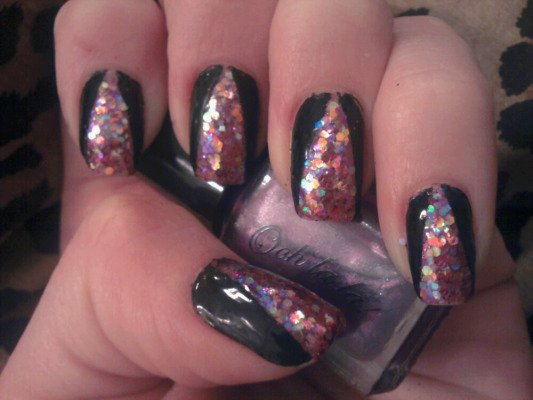 The color of polish will slightly affect the look of the glitter. 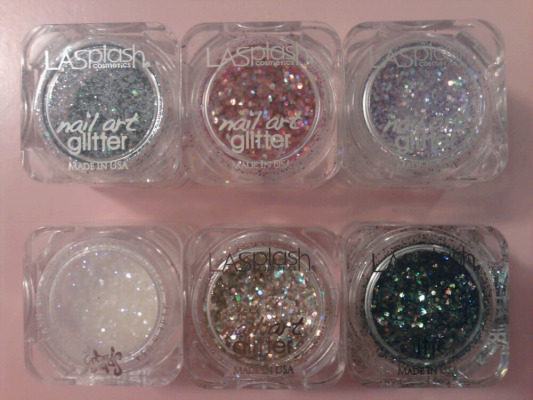 You might want to play around with the effect that the "undercolor" has on how your glitter will look. Let the first layer of polish dry. 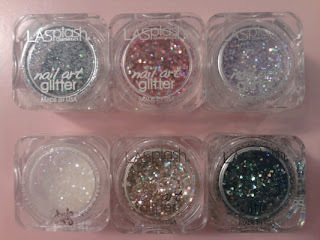 Open the pot of nail glitter, then apply the second layer of your chosen undercolor polish in the V, and dip! Make sure that the entire surface of your nail that is exposed makes contact with the glitter and then remove your finger from the glitter, lightly tapping your finger on the edge of the pot. 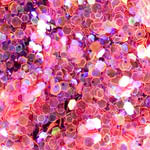 Gently use one of your other fingers to pat the top of the glitter; this helps to secure any loose pieces of glitter that are sticking up. Do not press, just pat lightly! Don't allow drying time and immediately start to slowly remove the tape. Because you want the glitter V to have a clean, solid edge, make sure that you carefully remove any stray pieces of glitter that end up outside of the V (or push them into the V); I recommend using an orangewood stick or a toothpick (I prefer a toothpick for greater accuracy). Also, if some of the pieces of glitter from the edge of the V clump to the tape as you remove it, carefully use your orangewood stick/toothpick to place some of the pieces of glitter back onto the V to ensure a crisp line of glitter (yes, this is tedious). You need a crisp line! For this step, it doesn't matter if your nails are wet or dry. If the tape leaves a residue on your nail, try to lightly scratch it off with an orangewood stick if there seems to be much; you want a smooth and even surface for the next polish application. I highly recommend using a striper brush for this task or a striper polish (see pictures below). I used L.A. Colors Art Deco Nail Art Polish in black. This line of striper brushes is terribly inexpensive ($1-$3) and great for stocking up on several colors, especially if you don't use stripers much or are just trying them. The only thing I dislike about this brand's striper polishes is that they can get a little goopy around the mouth while using it; I don't know if this is true for all striper polishes or just these. I'm guessing there's also a difference in the quality of the brush. 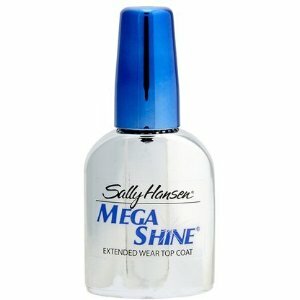 What's nice about using a striper polish as opposed to a striper brush? You don't have to clean it between colors and uses! 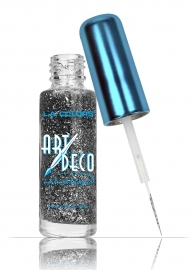 Starting at the base of your nail, drag the striper brush along the edge of the lines that create the V. The more crisp and solid your lines are from the previous step (The Glitz! ), the easier this will be. It is important to make sure you have enough polish on your brush to make a solid, continuous line, but not too much polish that your line isn't crisp. ("Crisp" seems to be the buzzword for this post!) 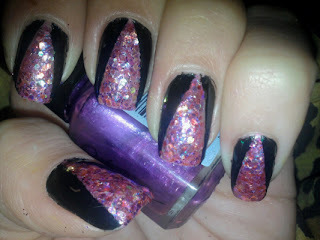 The polish needs to meet the glitter--no gaps or overlapping allowed! The advantage of allowing time for the glitter/polish from the previous step to dry is that it is easier to wipe off any oopsie overlaps that happen while applying the striper polish. 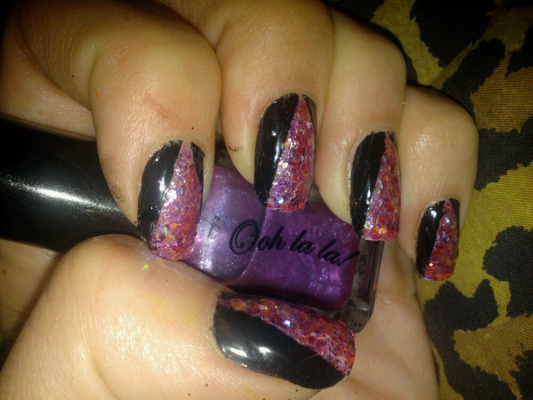 The last step to finish the design requires filling in the unpolished part of the nail outside of the V, on the other side of the black line from the glitter (where the tape was). I recommend using a regular polish brush for this task and matching the polish color to the color of your striping polish (or using the same nail polish color for both the striping and the fill-in and just switching brushes: for example, use the lacquer from the striper polish but a brush from a regular polish). I discourage using the striper brush to fill in the area where the tape was, because it will not yield a smooth surface.